The Penguins have had plenty of experience playing without their stars over the last two years. Among the team’s core players, only Marc-Andre Fleury and James Neal, whose new six-year contract merits honorary membership in The Core™, have managed to escape suffering considerable injuries in that time. The absences haven’t kept the team out of the playoff mix. Pittsburgh finished the 2010-11 season with the second-most points in franchise history and is on pace for 100 points again, despite leading the league in man-games lost to injury with 284. The Penguins are 34-21-5 (73 points) in 60 games so far. How have they fared with each of their stars missing some time? The following numbers break down the team’s winning percentages (regulation/overtime wins, regulation losses) and points percentages (wins and overtimes losses) when their best players are in and out of the lineup, and differences between the numbers when the players are on the ice. Take each number with a grain (or block) of salt. The percentages don’t account for overlapping games missed. For instance, Staal and Letang missed a number of games at the same time, presumably making the team more apt to lose. Those kinds of breakdowns might be splitting hairs and would require a good deal more complicated sort of math to figure out. And, quite frankly, my math is as reliable as Flyers goaltending. Start with the obvious. The Pens captain has been out for all but eight games this year and missed 41 a season ago. The team has managed to make due without him this season thanks mostly to Malkin’s MVP resurgence, but their record has still been better when granted the too-rare luxury of having him on the ice. For the brief time that Crosby was back in the lineup, Bylsma’s lines were actually whole for the first time in two years. It marked the first time this season that each of the big three centers were on the ice, and was the first time ever that Crosby and Neal played together, though Sid was reunited with old linemates Chris Kunitz and Pascal Dupuis. The team had a .625 winning percentage in Sid’s eight contests and earned points in 75 percent of the games he played, improvements on the teams .618/.650 numbers overall and .604/.635 percentages in the 52 games without him. 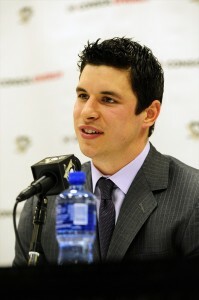 Sid’s appearances offer the smallest sample size on which to draw projections. There’s no question they’d be a better team with him on the ice. Any team would be. The team MVP and best candidate for league MVP, the Penguins wouldn’t be winning as they are without Malkin there to carry them to the postseason. His 1.38 PPG average paces the league, as does his point total (33-40-73). See? See how useless stats are? The Penguins were 4-2-1 in the seven games Malkin missed earlier this season, giving them better win and points percentages than in the 53 games he’s been in the lineup. Would those numbers h0ld up over the course of a season? You tell me. – Jordan Staal has missed 20 games this season. In those 20 games, the Penguins have a .650 points percentage. In the 40 games he’s played, the Penguins have a .650 points percentage. The numbers don’t lie: he is expendable. Trade for Nash. Winger for Sid. – Kris Letang may be the most valuable skater, if not the most irreplaceable, on the team. The Penguins have a .688 winning percentage with Letang in the lineup (23-14-3), a number which dropped much, much lower (11-7-2, .611 win percentage) in the 23 games he missed. Letang was out for each match in the six-game losing streak suffered in late December and early January. – Marc-Andre Fleury is on pace to start some 70 games this year, the most in his career. And with good reason. Fleury is 34-14-3 in his 48 games of record, a .689 winning percentage and .708 points percentage. Brent Johnson is 3-7-2 in 12 games of record, a .300 winning percentage and points percentage just above .400. If not for Malkin’s highlight-reel play, Fleury would be the team MVP for a second-straight season.